Surgery is accompanied by large fluid shifts. Blood can be lost from the operation, and water is lost through urine, evaporation out of the body and respiration. Fluids are given during surgery to counter the loss of fluid during the operation. After surgery, a person may continue to lose fluid and may have limited oral intake, so fluids are continued. Side effects are rare, but several can occur. Breathing difficulty is one possible, although unlikely, side-effect of a saline drip after surgery. In otherwise healthy people, the kidneys and heart are able to keep up with any excess fluid administered through an intravenous line. In persons with kidney disease that results in decreased urine output, excess fluid can build up in the blood vessels because the kidneys cannot eliminate the fluid from the blood into the urine fast enough. Fluid backs up into the blood vessels and leaks into the tissues. In the lungs the fluid interferes with gas exchange and causes breathing difficulty. Excess fluid can also cause breathing difficulty in persons with heart conditions, particularly ones affecting the left side of the heart. In left-sided heart failure, the right side of the heart pumps blood adequately to the lungs, but the left side does not adequately pump the blood out of the lungs and into the body. Swelling of the tissues, such as in the legs, is less likely in healthy people. It is more common in people with kidney, heart and liver disease. With kidney disease, the mechanism is the same for breathing difficulty. The kidneys cannot eliminate fluids quickly enough and they back up into the tissues. In heart disease, it is generally right-sided heart failure that causes swelling of the tissues. The right side of the heart pumps blood from the rest of the body to the lungs. If it pumps inadequately, fluid builds up and causes swelling. In some types of liver disease, the liver produces less protein for the blood. Some of these proteins help to keep blood in the vascular system. Without the protein, excess fluids, such as from a saline drip, will leak into the tissues, leading to swelling, according to "Harrison's Principles of Internal Medicine." Normal saline used in intravenous lines has a higher concentration of sodium and chloride than in the blood. The kidneys are responsible not only for regulating the total amount of fluid in the body, but also its composition. 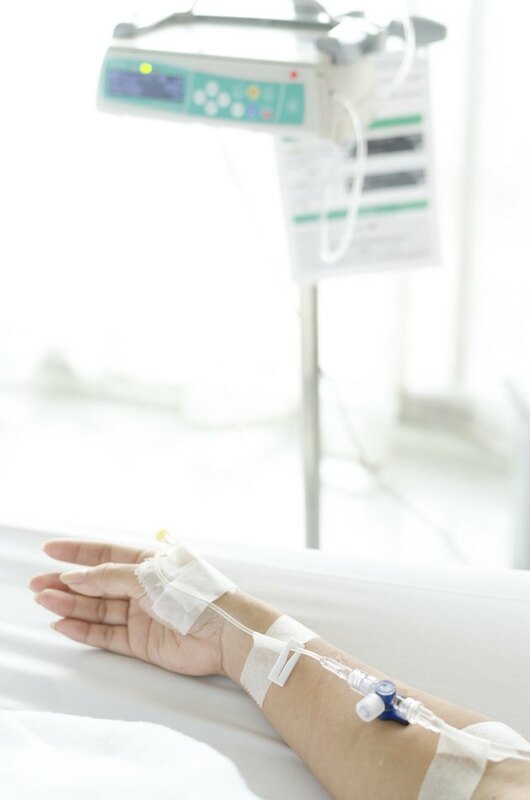 Kidney disease can render the kidneys unable to efficiently dilute the excess minerals in normal saline, leading to high chloride and sodium levels. High chloride can cause the blood to be more acidic. High sodium can cause weakness, lethargy and swelling. Very high sodium can cause seizures and coma. What Does Sodium Do in the Body?